Hello and welcome to another episode of Barreling It with Giancarlo Stanton. Alright Giancarlo, ready to play? Here’s the question. It’s the top of the 1st inning. It’s a tie game. There’s two men on and you’re in a 2-1 count. Stephen Strasburg throws you an 88 MPH pitch in your wheelhouse. What do you do? That is correct. 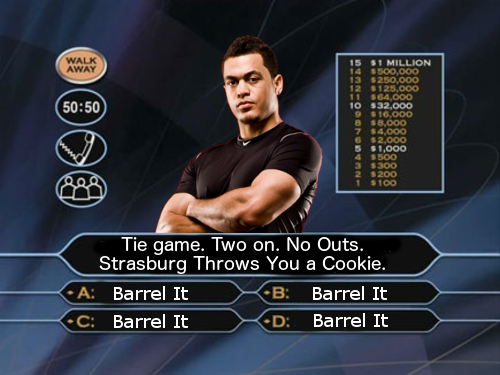 Join us next time for another episode of Barreling It with Giancarlo Stanton. We hoped you liked reading Barreling It with Giancarlo Stanton by David G. Temple! Why is there a category for “The” but not one for “Barreling It with Giancarlo Stanton”? This is an outrage. I would be okay with this if there were, in fact, several items in the “The” category, but no post has ever been filed under “The”.